For a list of boat buying and maintenance resources in the St. Croix Valley, click here. Quality of life is an ongoing theme for both lifelong and recent residents of the St. Croix Valley. 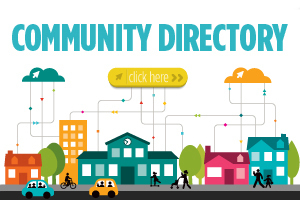 People choose to live in and around this area for a variety of reasons, chief among them typically include access to many recreational opportunities and the river valley’s exceptional beauty. As we approach our warmer months, boats will appear on the St. Croix River like a seasonal bloom that is joyfully anticipated by so many outdoor enthusiasts. 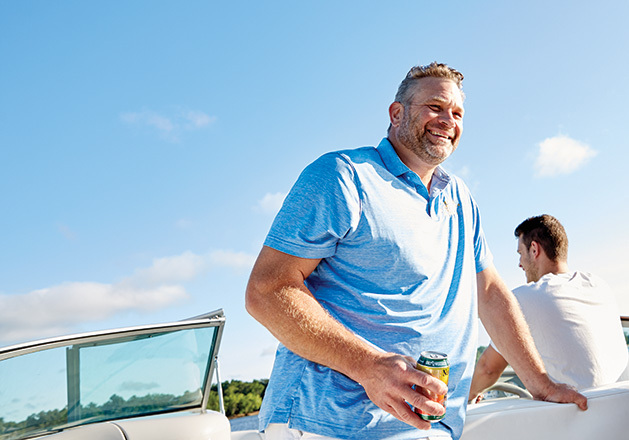 For those who’ve looked out over the water and longed to a part of that summertime fleet or have wondered if boat ownership makes sense for you, we spent some time with two families to discover what drew them to boating. The Burts wanted a boat that would work for their family, roomy enough to hold the kids and their kids’ friends, powerful enough to pull tubers, water skiers and wake boarders. “This boat has an open bow and can hold a dozen people comfortably or just our family of five,” Burt says. In order to get the most out of your investment in a boat, it seems appropriate to use it as much as possible. The Burts gave up golfing when they bought a boat because those competing seasonal activities each take a significant amount of time. Instead, the Burts boat on the St. Croix River every weekend, weather permitting, from April through October. “One of the advantages of the St. Croix River is that it connects to the Mississippi River and we could go all the way to the Gulf of Mexico if we wanted to,” Burt says. “But we usually stay between Stillwater, Minn. and Prescott, Wis. with at least one annual getaway to Treasure Island Resort, Redwing, Lake City, Wabasha or Lake Pepin for a festival, concert or local event.” But they will often just cruise locally, dock someplace and head into one of the many inviting river valley towns for food and beverages or, “we are happy to throw an anchor and just float and swim … It’s also been a joy to teach our kids and their friends to water ski and wake-board,” Burt says. 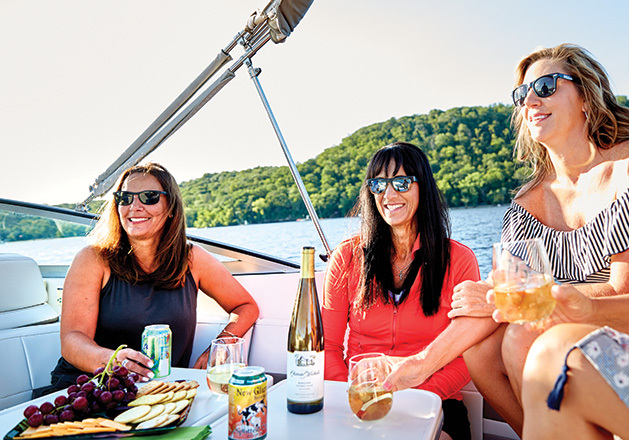 One of the Burts' favorite boating excursions is to make a “shrimp run down to Point St. Croix Marina in Prescott, Wis. where there are primarily only two things on the menu: grilled shrimp and Heggies Pizza, along with a cooler filled with beer and pop choices,” she says. Both families look forward to spending July 4th boating on the St. Croix River. “We connect with other boaters, tie the boats together in Hudson Bay, swim, eat, goof off, etc. and then watch the fireworks,” Burt says. “We really love 4th of July on the river. Being on the river at night, you can see fireworks on both the Minn. and Wis. sides for miles and miles. It’s a really unique experience,” Topp says. Burt and Topp agree that although boat ownership requires some maintenance, it is relatively minimal compared to cabin ownership and is more convenient for their busy lifestyles. “There is no yard, no plowing, no trees to trim, etc.,” says Topp. “We find we get more time on the boat to enjoy it because no real chores need to be done.” Also, Topp finds that living so close to the river provides the opportunity to use their boat around their kids’ scheduled activities. “If there is a weekend tournament or a dance competition for our kids, we can still get out on the boat around their schedules. It’s flexible and easy,” Topp says. Burt notes that prospective boat owners should also invest in learning how to drive a boat along with learning the laws and rules of the waterways. “Some basic education is helpful to have a safe and enjoyable experience,” she says.